The guys have an awkward encounter with the "King of the Gypsies," who has an incredible underground stash but insists he can't be bought. A garage door in Indiana leads to a 1950s wagon Mike can't leave without--if he can sweeten the deal. How many episodes of American Pickers have you seen? Burlesque performer Tempest Storm reflects on her long career and her strained relationship with her family. Mike Wolfe: I'm Mike Wolfe. Frank Fritz: And I'm Frank Fritz. Mike Wolfe: And we're pickers. Frank Fritz: We travel the back roads of America looking for rusty gold. We're looking for amazing things buried in people's garages and barns. Mike Wolfe: What most people see as junk, we see as dollar signs. Frank Fritz: We'll buy anything we think we can make a buck on. Mike Wolfe: Each item we pick has a history all its own. And the people we meet? Well, they're a breed all their own. We make a living telling the history of America... one piece at a time. Q: Mike Wolfe and Frank Fritz visit a location for pickin They claim to pay cash for items they buyand the end of the visit we see them load up their truckHow much cash to they carry with them ?Do WE ever see them Pay for anything ?. Great show, great characters and it is a learning experience. I love this show. 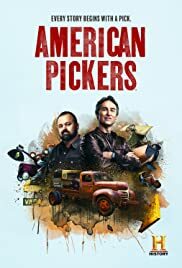 American Pickers is one of the best reality TV shows to come out of America and even rivals my favorite reality show, Bargain Hunt from the UK. Mike and Frank whilst they seem a little over the top for us Aussies, simply love their job and their passion shows. In a strange way it is a bit Abbott and Costello-ish but that is the beauty of the partnership. Add Danielle who is holding the fort whilst Mike and Frank are away and the team is complete. The characters they meet in their day to day travels picking are the heart and soul of America and every nation. Some of the collections they unearth are to be envied by us all. But the true gem is the fact we learn about the history of the items they pick and the companies that made them. If you read this and have never watched the show I hope this inspires you to have a peek.